Golf is a famous outdoor sports that is played by millions of people around the world. From the outside, the game seems to be nothing more than trying to thrust a small hard ball into many holes, with the minimum number of strokes. However, when we have a closer look at the skills and techniques needed to play it, we discover that there is more to this game. Apart from being an opportunity to socialize with people, golf has significant effects on both body and soul. Below are five important benefits that will make you rush to the Golf course. Golf has many Health Benefits: Playing Golf involves a lot of walking. Following the ball and trying to hit it into the hole can make you walk up to 6 or 8 kilometers at times. Do you know that statistics has shown that average player burn approximately 300 calories every hour when playing golf? Furthermore, the need to plan your putts is a really healthy workout for your brain. On the whole, golf helps you stay fit mentally and physically. 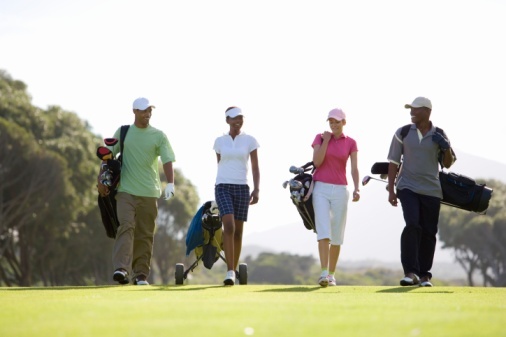 Golf is a way of socializing: The golf course is a fertile ground for making new friends. Whenever you go to play golf, you are likely to meet new people and make see your relationship with them develop into friendship. Especially if you have moved to new place, there is no better place of meeting like-minded people than the golf course. Its pleasant and relaxed atmosphere fosters the development of human relations. Many Koreans and Japanese come to Malaysia and form small golf community of their own. Golf is Anti-stress: Golf acts miraculously on both body and soul. It is one way to have an active social life. You meet people who share the same interests and hobbies. Your interaction together is likely to improve your self-esteem as you identify yourself with them. Moreover, this game puts you closer to nature as you walk through the green golf course. What else do you need than an active social life, regular physical activity and being close to nature to fight stress? Golf takes you on a short vacation: The relaxing effect of Golf is similar to being on vacations. It gives you relaxation. Some people take a whole day off work to play golf. No matter for how long you play , the Golf course is a real holiday resort. Golf is a family activity: Golf is a good way to gather the family together. It can appeal to all family members regardless of age. Golf helps the members of one family to get away from all the hustle and bustle of life and to spend some time together.